Aretha Louise Franklin (March 25, 1942 – August 16, 2018) was an American soul and R&B singer. She was called the "Queen of Soul". She was best known for her songs "Respect", "Think", "Chain of Fools", and "(You Make Me Feel Like) A Natural Woman". 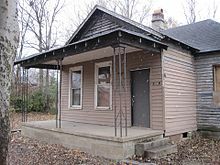 Aretha Louise Franklin was born at a two-room house in Memphis located at 406 Lucy St. She was the third of four children born to Barbara (née Siggers) and C.L. Franklin and the fifth of six overall in between past relationships by her parents. Franklin's family moved to Buffalo, when Franklin was two, and then by four, had settled in Detroit. Following the move to Detroit, Franklin's parents, who had a troubled marriage, split. Due to her father's work as a Baptist minister, Franklin was primarily raised by her grandmother, Rachel. Franklin suffered a tragedy when her mother died in Buffalo when Aretha was ten. Franklin sang in church at an early age and learned how to play piano by ear. By her late preteens, Franklin was regularly singing solo numbers in her father's New Bethel Baptist Church. Franklin's father, C.L. (short for Clarence LaVaughn), was a respected and popular preacher. Franklin grew up with local and national celebrities hanging out at her father's home including gospel greats Albertina Walker and her group The Caravans, Mahalia Jackson and Clara Ward, three women who played a pivotal role in her vocal development as a child. Franklin married Ted White in 1961 but divorced him in 1969. She had four sons, one of which she shares with White. Franklin was married to Glynn Turman from 1978 to 1984. In 1998, Franklin performed at that year's VH1 Divas Live concert with Céline Dion, Carole King, Mariah Carey, Shania Twain, and Gloria Estefan to sing songs like "(You Make Me Feel Like) A Natural Woman", "Testify", and "You've Got a Friend in Me". In 2010, Franklin underwent cancer surgery for purported pancreatic cancer. In 2013, she cancelled two tours due to an unknown illness. In 2017, Franklin cancelled many concerts due to an unknown illness. She asked her fans to keep her in their prayers. On August 13, 2018, Franklin was reported to be gravely ill at her home near Detroit. She was reported to be under hospice care and surrounded by friends and family. Stevie Wonder and Jesse Jackson, among others, had visited her. Franklin died at home in Detroit on August 16, aged 76. The cause was reported to be advanced pancreatic cancer. Business Insider reported that Franklin's net worth was $80 million at the time of her death and that she did not leave a will. Franklin won 20 Grammy Awards in her lifetime, including two special awards for Living Legend (1991) and Lifetime Achievement (1994). 1 1968 Best Rhythm & Blues Recording R&B "Respect"
3 1969 "Chain of Fools"
4 1970 "Share Your Love with Me"
5 1971 "Don't Play That Song for Me"
6 1972 "Bridge over Troubled Water"
9 1974 Best Female R&B Vocal Performance R&B "Master of Eyes"
10 1975 "Ain't Nothing like the Real Thing"
11 1982 "Hold On...I'm Comin'"
12 1986 "Freeway of Love"
14 Best R&B Performance – Duo or Group with Vocals "I Knew You Were Waiting (For Me)"
16 2004 Best Traditional R&B Vocal Performance R&B "Wonderful"
17 2006 Best Traditional R&B Vocal Performance "A House Is Not a Home"
18 2008 Best Gospel-Soul Vocal Performance by a Duo or Group Gospel "Never Gonna Break My Faith"
↑ Hear Aretha Franklin (music and interviews) on the Pop Chronicles (1969). ↑ "Sister Ree's Scrapbook, An Aretha Franklin Photo Gallery 13". Retrieved 2010-11-06. ↑ "Remembering the Queen of Soul: Aretha Franklin's Life in Photos". PEOPLE.com. Retrieved 2018-08-16. ↑ "Glynn Turman's Final Visit with Aretha Franklin Was 'Full of Closure,' Says Her Ex-Husband". PEOPLE.com. Retrieved 2018-08-25. ↑ "Aretha Franklin Receives Honorary Doctorate From Yale". 24 May 2010. ↑ "Future Rock Legends - Rock and Roll Hall of Fame Class of 1987". www.futurerocklegends.com. ↑ Adam Graham (June 10, 2017). "Aretha Franklin gives Detroit something to remember". The Detroit News. Retrieved August 4, 2017. ↑ "Aretha Franklin said to be 'seriously ill'". BBC Online. BBC News. August 13, 2018. Retrieved August 13, 2018. ↑ Huschka, Amy (August 14, 2018). "Aretha Franklin 'gravely ill' in Detroit". Detroit Free Press. Retrieved August 15, 2018. ↑ Dickson, James David (August 15, 2018), "Aretha Franklin honored at church prayer service", The Detroit News; accessed accessed August 15, 2018. ↑ Clarendon, Dan (August 14, 2018). "Stevie Wonder Visits Aretha Franklin As 'Queen of Soul' Rests in Hospice Care". US Magazine. Retrieved August 15, 2018. ↑ Fekadu, Mesfin; Itale, Hillel (August 16, 2018). "'Queen of Soul' Aretha Franklin has died". Associated Press. Retrieved August 16, 2018. ↑ Browne, Douglas Wolk,David (2018-08-16). "Aretha Franklin, Queen of Soul, Dead at 76". Rolling Stone. Retrieved 2018-08-16. ↑ "Aretha Franklin died with a reported net worth of $80 million and no will". Business Insider. Retrieved 2018-08-25.